Mount Kailash, since ages, is considered as sacred and one of the sought-after pilgrim centers in India to attain salvation. Among the India pilgrim tours, Kailash mansaroavar yatra is very popular and devotees from all across the globe book this package. 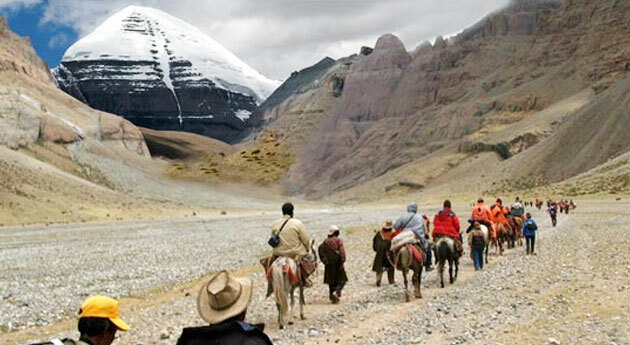 There are numerous travel operators, who offer kailash mansarovar helicopter tour package for the devotees wanting to explore every bit of the trip but are time constraint. The devotees could opt for the 10-day travel trip that would also allow them to make their journey auspicious with their visit to Mansarovar Lake, Pashupatinath temple, etc. Trip Details : Here is the synopsis of the itinerary provided to give you an idea of day wise journey that you will travel through this Kailash Mansarovar Yatra By helicopter travel package. Day 01: You arrive at Kathmandu and halt at a hotel for an overnight stay. Day 02: Enjoy this day in sightseeing tour in Kathmandu. Excursion to Budhanilkantha Temple, Pashupatinath Temple, and Baudhanath Stupa. Thereafter, reach to NepalGunj via flight. Overnight stay at hotel in NepalGunj. Day 03: Board flight to reach Simikot. After reaching Simikot, you will be transferred to your hotel to enjoy an overnight stay. Day 04: Fly down to Hilsa. After arriving at Hilsa, take a small walk to reach Sher and thereafter, drive to Purang through the Japanese land cruiser. You will have an overnight stay at a guesthouse in Purang. Day 05: Drive to Mansarovar Lake. Also visit the Rakshas Taal on the way to the Mansarovar Lake. The overnight stay will be at Tibetan Dharamshala or a guesthouse. Day 06: Reach Asthapad via Darchen. After sightseeing at Asthapad, continue the drive to Yama Dwar. Trek from Yama Dwar to Diraphuk. Return to the guesthouse at Darchen for overnight stay. Day 07: Trek to Dolma-La Pass. Thereafter, travel downhill to Zhulthulphuk valley. Return to your guesthouse at Darchen for overnight stay. Day 08: Board on a land cruiser and drive down to Hilsa. Halt for an overnight stay in the guesthouse at Hilsa. Day 09: Through helicopter, fly back to Simikot. Thereafter, board a flight to NepalGunj and then reach Kathmandu. The overnight stay will be at a hotel in Kathmandu. Day 10: Board a flight from Kathmandu towards your onward journey. 1. In order to overcome any sort of delay, the experts advise to 1-2 extra days. 2. As the nature of travel is possible to cause changes in the schedule. Thus, in such a case, the tour operators and partners are liable. 3. According to the adverse weather condition, the travel operators are also liable to make changes in the said itinerary. 4. Following of the itinerary by the group is also required. The entry as well as the exit has to be at the same time with the entire group and as stated in the schedule. This tour packages is designed intelligently by the experts to make the devotees enjoy the best ever. The ten days are utilized to excellently make it to be a perfect pilgrim tour.